This is the updated and expanded Third Edition of a book first published in 2007. What’s new in this edition? According to Bill Capodagli and Lynn Jackson, they feature organizations “that are predominantly in start-up mode or have revamped their strategies to become more customer-centric. The lineup includes six entities that have recently launched their businesses or have reinvented their cultures…There are also three well-established organizations that are striving to continuously to improve…[and others] that demonstrate how [the Walt Disney Company’s] Dream, Believe, Dare, Do Principles apply in a small community business. And, finally, how Ottawa County, Michigan, one of the most progressive state administrative divisions in the United States, has used each element of the Disney Way as a starting point to create an amazing culture over a period of three years.” Chapters 12-14 are brand new. I recently re-read Neal Gabler’s biography of Walt Disney and then as I began to read this Third Edition I was again reminded of an incident years ago when one of Albert Einstein’s Princeton colleagues gently chided him for asking the same questions every year on his final examinations. “Quite true. Guilty as charged. Every year the answers are different.” Fifty years after Walt Disney’s death, the Dream, Believe, Dare, Do Principles remain relevant and instructive to leaders in almost any company — whatever its size and nature may be. However, the nature and extent of applying those principles have changed significantly in a global marketplace that has become more volatile, more uncertain, more complex, and more ambiguous than at any prior time that I can remember. 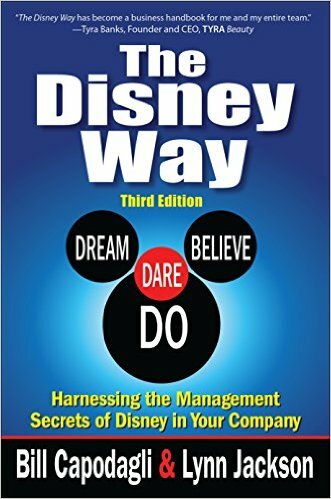 For those who have not read either of the previous editions of The Disney Way, Capodagli and Jackson provide an abundance of information and insights that trace the development of a truly unique organization as well as the development of its visionary founder and his business philosophy whose “magic” endures because of values-driven, customer-centric, high-impact management. By now there are few (if any) “secrets” to be discovered. The challenge is to complete a reality check on your organization. For better or worse, what differentiates it from its competition? Strengths? Vulnerabilities? And what is (what really is) worker — “cast member” — morale at all levels and in all areas of its operations? Most important of all, does it have a culture within which personal growth and professional development are most likely to thrive? Are its customers — “guests” — evangelists? My guess (only a guess) is that each reader who checks out these micro profiles will gain at least 3-5 invaluable lessons (if not more) that can be applied to their organization immediately. And add to that number the valuable lessons to be found in other material throughout the lively narrative.